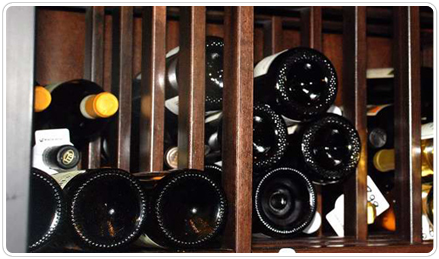 We also strongly recommend off-site wine storage when companies need a cheap bulk wine cellar option. From concept to manufacturing, WholeCellar.com’s multidisciplinary engineering expertise enables us to provide our designers with leading edge insight and guidance into all aspects of wine storage and wine cellar design. Work with our design team to balance practical engineering considerations such as display loading, wine cellar climate control including humidity, insulation, lighting and material considerations along with looks and accessibility. We dedicate ourselves to realizing each client’s unique vision by turning it into reality to add top value to their brand, restaurant, hotel and or resort. If you are a designer we can turn your client’s Interior Design Drawings into CAD drawings that are fully engineered for looks, stability, and functionality. Our design department enables accurate and competitive pricing and visualization of the finished work. Work with us to safely accelerate your project and know where you stand within a reliable budget. Time Warner Building Manhattan New York, New York. 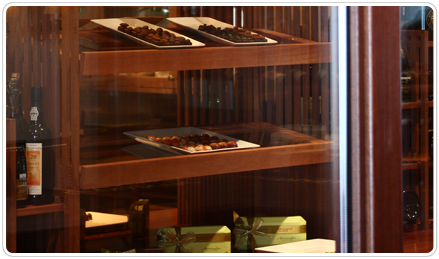 Located in the heart of Manhattan at Columbus Circle – 59th Street and Broadway. Time Warner Center is one of New York City’s most iconic destinations delivering an experience where visitors can dine, shop, live, be entertained and drinks lots of wine. 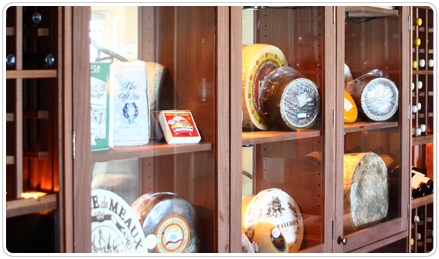 Located on the 3rd floor, A Voce (which means “word of mouth”) features stunning glass walls which exhibit over 10,000 bottles in wine storage capacity. 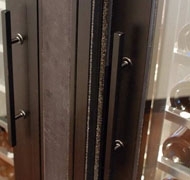 Each component of the eight wine cellars is custom-made for designer David Rockwell. 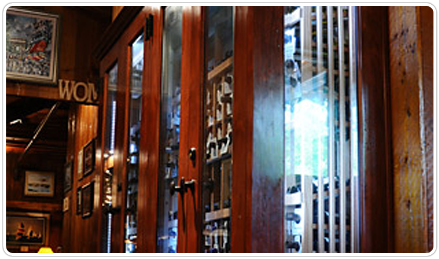 The custom cabinet wine cellars are insulated and sealed with sliding doors to maintain temperature and humidity. 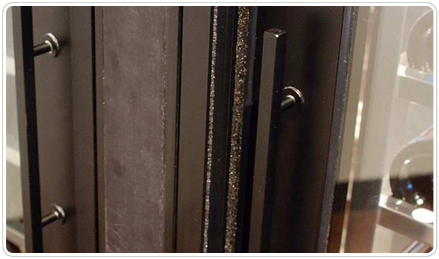 The custom outer cabinet look is a black anodized aluminum finish to complement the look of the restaurant. 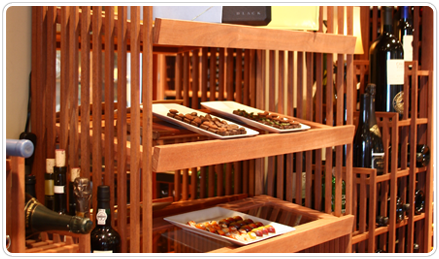 The custom wine racks are made of two different materials for the two different looks and locations of the restaurant. 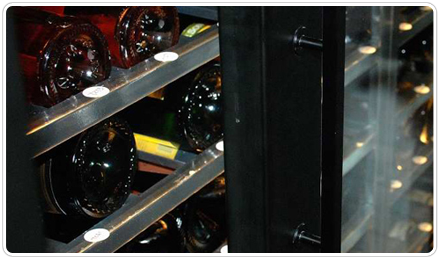 A clear powder coat aluminum wine racks area and a stained mahogany wood wine racks area for bulk storage. Laguna Beach, California – Located in an upscale Five Star Southern California Resort, ENO is home to over 1500 bottles, many of which are stored in an illuminated, floor-to-ceiling glass tower. 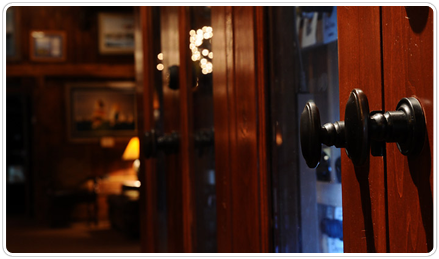 The mood is relaxed and warm, with a cozy, wine cellar feel. 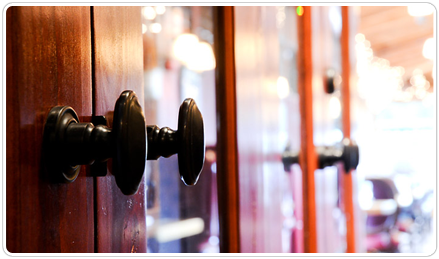 The perimeter of the wine bar is lined with dark mahogany with horizontally laid wine bottles nestled in custom wood wine racks. 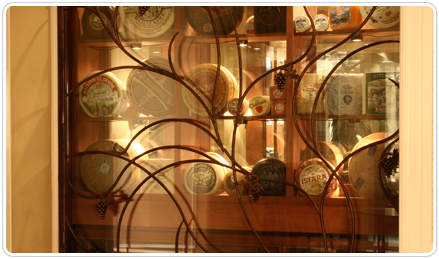 Due to the perfect environment and inviting wine cellar, ENO has become a local favorite Southern California wine tasting bar pairing the finest wines with artisan cheeses and hand-crafted chocolates. 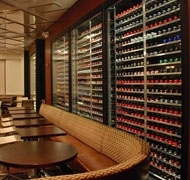 Magnificent Mile – Chicago Illinois – This stylish and fun Chicago wine tasting room at the InterContinental Chicago Magnificent Mile is an excellent example of an intimate custom wine cellar design. Because of its vision, design, and build the hotel is able to provide Master Sommelier service complete with wine flights, chocolate and cheese tastings from around the world. 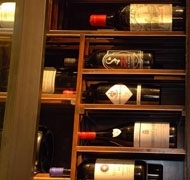 Reminding guests of an intimate wine cellar, this award winning wine room delights all Windy City leisure travelers, business executives, and date-night couples. 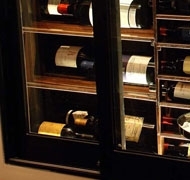 Created with capacity and the wow-effect in mind, both were accomplished by introducing dark wood, glass, refrigeration, and specific racking styles which include room for magnums, Champagnes, blue chip 750 ml, half bottles, and other oddly shaped bottles. Millennium Park – Chicago Illinois – Showcasing up to 500 different varietals of wine from around the world, ENO Fairmont Chicago is 2010 Winner of Wine Spectator Award of Excellence. 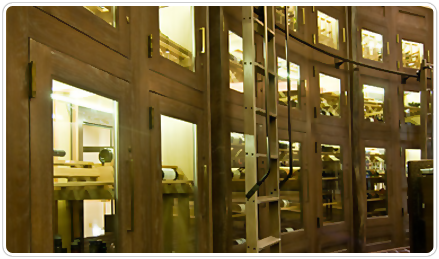 Dramatic 10-foot-tall temperature and humidity controlled white oak wine cabinets showcase and store wines at their optimal storing temperatures. Atlanta Georgia – A Midtown icon, the Georgian Terrace Hotel is located in the heart of Atlanta’s business and cultural district. 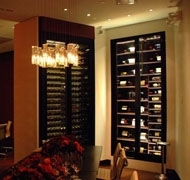 Characterized as “Atlanta’s Modern-Classic”, the Livingston Restaurant and Bar could not be more modern. 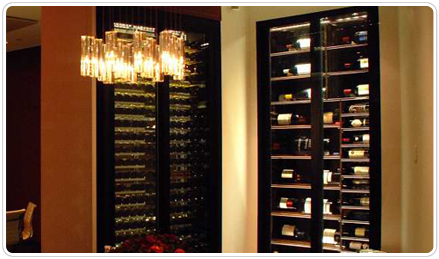 Hence stainless steel custom wine cabinets are spread across the restaurant floor. 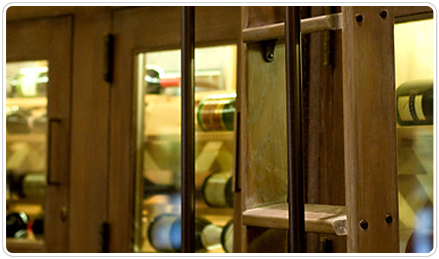 Each custom wine cellar cabinet is properly insulated to keep constant temperature and humidity. 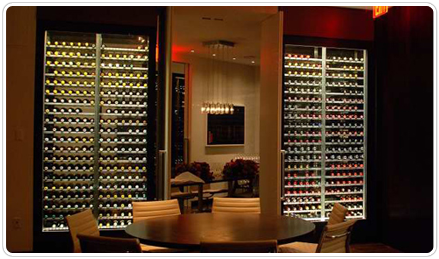 Since the restaurant is not a place for cooling unit exhaust, split system wine refrigeration was used to eliminate any condenser noise. 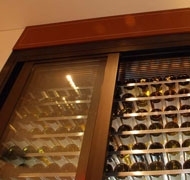 Each wine cabinet has custom metal wine racking in keeping with the restaurant’s modern theme. San Francisco, California – A San Francisco Landmark, the House of Prime Rib is known for its quality, quantity, and longevity since 1949. Prime rib and other cuts of USDA corn fed beef are synonymous with red wines from around the world. 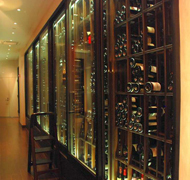 With that said, a beautiful traditional custom wine cellar was created for the goal of up-selling from its wine list. 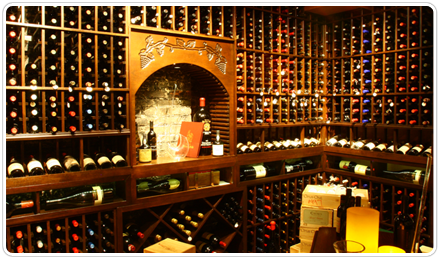 The custom wine cellar is complete with a different wine racking option, for example: archway with hand-carved grapevines, large capacity diamond bin storage, individual bottle storage, ladder and rail system and much more. 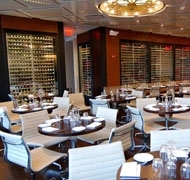 North State Street Chicago, Illinois – CiboMatto Restaurant is the modern Italian steakhouse hot spot at Chicago’s AAA Four Diamond the Wit Hotel. Literally meaning “crazy food”, CiboMatto is also the wine hot spot in downtown Chicago. 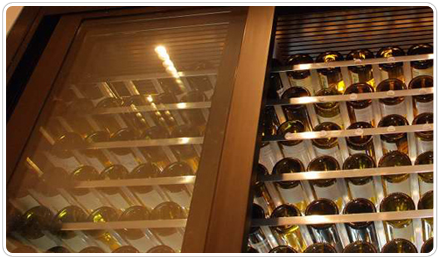 The custom made modern oval-shaped wine cellar tower is made from stainless steel and has a beautiful mirror finish that beckons for attention. If you look closely you will see the detail of the quality metal finish and tight seal for constant temperature and humidity control. 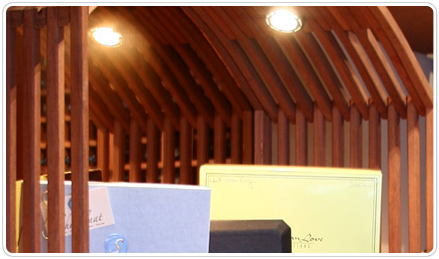 Los Olivos, California – Nestled in Los Olivos, CA Tre Anelli’s tasting room is by far becoming one of Santa Maria Valley’s favorite destinations. 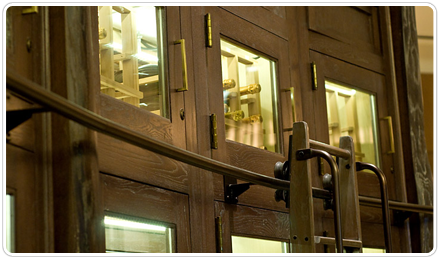 With an old world Spanish and Italian wine making mystique, the winery’s ambiance required the same style wine racks. Made from distressed wood, the diamond bins were designed for maximum capacity and strength. New York NY; A Kimpton Resort – Near Times Square, The Muse Hotel has recently undergone a multi-million dollar renovation making a custom wine cellar a main attraction. 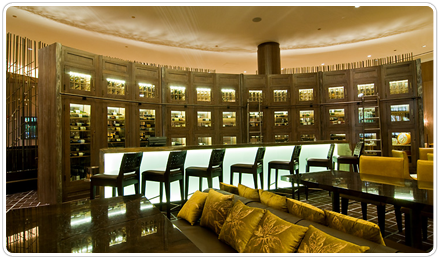 NIOS Restaurant and Wine Bar is home to a Master Sommelier that has created a wine collection like no other in the city. 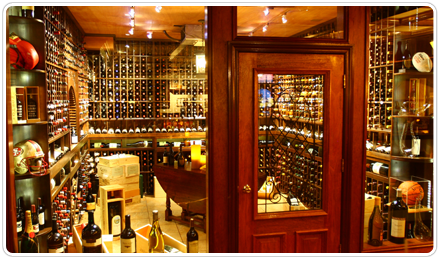 Because there was no room for a walk-in wine cellar, a custom wine cellar cabinet was constructed. 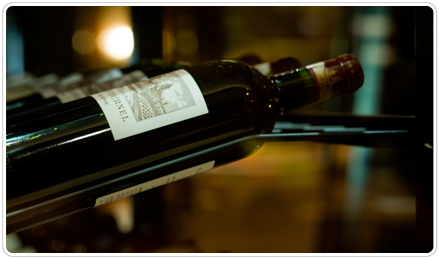 At NIOS, a hand-selected wine list showcases 100 international selections.